Every instrument with TSshield built in has a telematics card installed that will communicate to the Sokkia servers every day. You can get instant wireless software and firmware updates in the field and even download them directly via WLAN connection. You can even Lock your instrument remotely if it is lost or stolen. This theft deterrent functionality is the first in the industry! Registration and usage of TSshield function are totally free. There is no need to pay for any communication fees! 1. TSshield function is not available initially in some countries until TSshield certification process is completed in each country. Please contact your local dealers for more detailed information. The RED-tech EX is Sokkia's drastically improved REvolutionary Digital processing Technology: a revolution in the field of measuring distances; the result of continuing, smart developments by Sokkia's R&D team in Japan. RED-tech EX, the third generation of RED-Tech distance meters, offers greater speed, accuracy and range. It undoubtedly sets the trend for further generations of precision electronic distance meters. Almost all of Sokkia's total stations are equipped with the RED-tech electronic distance meters (EDM) which enables them to make accurate distance measurements. But what exactly is so revolutionary about RED-tech EX? 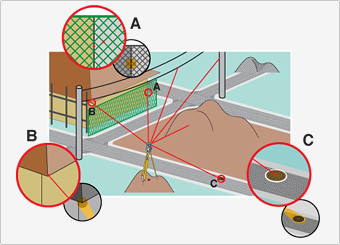 The phase-shift and pulse methods are commonly used in the geodesy field for taking measurements without using reflectors. RED-tech EX, Sokkia's revolutionary digital signal processing technology, uses a unique procedure to analyze four light waves at the same time. The on-board processor continually compares thousands of measurements in real-time with the recurring data that has been processed. In doing this it checks and locates wave discrepancies such as interference that cannot be filtered out (atmospheric conditions) and temporary obstacles (cars, leaves etc). This means that only the pure, unadulterated actual signal that has been returned is used for calculating the waves' exact phase shift. This phase shift ultimately gives the exact correction which enables the optimum distance measurement value to be calculated. The intelligent RED-tech EX processor is able to learn how to execute increasingly accurate, repetitive measurements by itself. By using this combination of digital processing and phase shift algorithms technology, Sokkia total stations quite simply achieve the best performance in terms of accuracy, repeatability and reliability within the target range of 30 cm to 500 meters. Pulse EDM's emit a concentrated, short pulse of high density laser light and a built-in clock measures the "time of flight". The longer the light travels the better the time difference between emitting and receiving can be determent. The downside of this technology is encountered when measuring distances less than 50 meters since the clock simply cannot measure the time difference accurately enough due to the extremely short "time of flight". This means that it is not a problem to measure extreme distances up to 2000 meters for example. Whether or not this is a positive sales point is open to question since no one wants to measure an object that far away due to the difficulty of aiming accurately and capturing the returned signal. Phase shift does not use a clock so it is easily possible to measure objects just 30 cm from the EDM. This is a definite advantage compared with the pulse method. By far the majority of reflectorless measurements are made to objects within a range of 200 meters; but RED-Tech EX reaches 500 meters just to be absolutely sure. The phase shift measurement spot is also much smaller then the pulse diameter. This enables very small objects such as power lines, the corners of buildings, manholes etc. to be measured even if obstacles such as leaves or fences are in the way. The most important feature is that the accuracy of phase shift EDM's is greater than any other type of EDM. Phase shift technology has to emit a continuous laser beam and this has the positive result of producing a continuous stream of data. In order to achieve accurate results high output power is needed. This is often regarded as being hazardous, which is true when it contacts the human eye. However, the human eye has a reflex speed of 0.1 seconds which makes it safe to use. The alternative EDM's are not visible. These pulse lasers will also damage eyes over a long period of exposure but because they are invisible the human eye will not react and so could be damaged. Since the pulse method uses invisible light, the manufacturers of this type of equipment embed an extra laser which functions as a laser pointer. The possibility exists that this laser pointer may not be aligned with the EDM. If this should be the case, the distance data will be derived from a different position to the one that the pointer is targeting. This error is simply impossible with our RED-Tech EX since the EDM laser is used for both the pointer and distance measurement functions. RED-tech II, a technology developed by Sokkia, stands for revolutionary digital signal processing technology. It enables quick, accurate and reliable distance measurements. EDM stands for electronic distance meter. All Sokkia total stations are equipped with an electronic distance meter enabling them to do distance measurements. Sokkia's revolutionary digital signal processing technology, RED-tech II, relies on a unique procedure for the analyses of light beams. When a measurement is initiated, a light beam is emitted from the instrument. This beam exists of 3 different light frequencies. Using an A/D converter the instrument picks up these 3 frequencies and converts it to a digital signal before the processor calculates the distance on the basis of difference in phase shifts between the emitted and returned light waves. This is a continuous process which leads to a very reliable result. This technology enables accurate measurements through obstacles such as chain-link fences, tree branches but can also handle a car passing by while doing a measurement. In the geodesy field, two measuring methods are common; phase and pulse measurements. Sokkia instruments use the phase measurement technique because it's proven to be the most accurate way of distance measurement and it allows a narrow beam. Although the pulse method has a wider range, the disadvantage of this technology is the poor performance on a short range due to the limitations of the built-in clock. Because of our technology all Sokkia RED-tech II total stations have an extremely narrow laser beam which results in very accurate measurements from 0.3 m up to 350 m to corners of walls or high voltage electricity wires or other difficult-to-measure objects can be done with pinpoint accuracy. Also slant measurements such as on manholes can be done with high precision because of the super narrow beam. Another important feature is the ease of use. Just use the laser pointer to aim at the object you want to measure, make your measurement and within seconds you'll have your exact distance, without looking through the telescope. The RED-tech distance has been improved signifi cantly and has new benefi ts in measuring time, range and power consumption. This has resulted in the RED-tech II distance meter with focus on the Class 2 laser distance meter. Measuring times have been improved by 30% in Fine mode and the measuring range is improved up to a range of 200 m. Furthermore the power consumption has been brought down which enables the user to work longer. This decrease of power consumption is including the use of Bluetooth® wireless technology. The ultra-narrow laser beam enables accurate measurements through obstacles such as chain-link fences, tree branches, etc. Broader beam models: Both the fence and wall get measured, which leads to erroneous measurement. The measuring beam is extremely narrow, so distances to walls and corners can be measured with pinpoint accuracy. Broader beam models: A wide measuring beam hits points near and far at the same time, resulting in inaccurate measurement. Measurements at small incident angles, such as with manholes on the road surface, are handled with high precision by the ultra-narrow laser measuring beam. Broader beam models: Wider measuring beams end up covering a larger area than expected at small incident angles, resulting in measurements that are too long or short. The SFX (Sokkia Field-info Xpress) function harnesses the power of the internet to enable Sokkia’s Total Stations to send data to and receive data from your office instantaneously. Sokkia’s original absolute encoders with IACS (Independent Angle Calibration System) based on Sokkia’s digital level RAB (Random Bi-directional) Code technology. Highly stable, dependable encoders have been further refined making unprecedented high accuracy angle measurement possible.